What: Revolution Running welcomes the big names, Olympians and stars of the running and triathlon scene for a unique evening. Come out to meet them, ask questions and hear their stories. All net proceeds will go to benefit two non-profit causes who are in need after utilizing so many of their resources during and after the High Park Fire in Fort Collins. Additional Info: Free RevolutionAvery beer will be on tap in the barrel room for anyone attending the event. 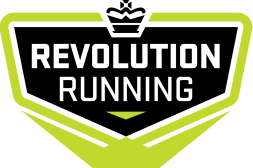 Athletes, Revolution Running, and BOOM Yogurt will be hosting a raffle at the end. Abbott became the first American ever to win the Giro Donne, one of the Grand Tours of women's bicycle racing. She is currently transitioning into triathlon after her world-class career as a cyclist. 2000, 2004, and 2012 US Olympic Marathon Trials and was 4th – Olympic Alternate in 2004. Recently he won and set the course record at the 2012 Colfax Marathon. Career highlights include a first place finish in the Team Relay World Championships and twice a 3rd place and twice a 5th place finishe in the Ironman 70.3 World Championships. Cunningham is currently ranked 3rd in the world at the 70.3. Durden was a member of the titular 1980 Summer Olympics United States marathon team, placing second against what to that point was perhaps the deepest field of American marathoners ever assembled. With a personal record of 2:09:57, Durden recorded 25 sub-2:20 marathons in less than a decade. He ranked among the top ten US marathoners six straight years, reaching seventh in the world in 1982. Gambles was Ironman 70.3 Boulder Champion and Course Record Holder in 2011 and Champion here yet again in 2012. Lake Stevens 70.3 in both 2009 and 2010. Other wins include Vineman 70.3 (2009) and Port Macquarie (2011). He was 4th in the world at the 70.3 Championships in 2010. Hartman won the Twin Cities Marathon in 2009. He was the top American finisher at the 2010 Chicago Marathon and was fourth at the Boston Marathon in 2012. Throughout Jurek's career he has been one of the most dominant ultramarathon runners in the world, winning many of the sport's most prestigious races multiple times, including the Hardrock Hundred (2007), the Badwater Ultramarathon (2005, 2006), the Spartathlon (2006, 2007, 2008), and the Western States 100 Mile Endurance Run (1999-2005). In 2010, at the 24-Hour World Championships in Brive-la-Gaillarde, France, Jurek won a silver medal and set a new US record for distance run in 24 hours with 165.7 miles. Matt was a 2010 Olympic Trials Qualifier. He ran for Adams State College and has been an elite runner in the U.S. and Colorado scene ever since. Moody was 5th at the 2008 Olympic marathon trials and the 1st American at the World Marathon Championships. Plaatjes became the first American to win a gold medal in a long-distance event at World Championships. Hewas the marathon champion at the 1993 World Championships in Athletics in Stuttgart and has won over 25 major marathons. In 2009, Reed has won 7 triathlons and the Toyota Cup Series. His wins came at Ironman California 70.3, Miami International Triathlon, Pan American Championships, REV 3 Half-Ironman, Life Time Fitness Minneapolis, Chicago Triathlon and Dallas Triathlon. Reed was named USA Triathlon’s Athletes of the Year for 2008. He won the US Olympic trials and placed 32 at the Beijing Games. Reed also finished 5th in the 2008 World Championships, the highest place ever for an American male. Slattery was a two-time NCAA champion while competing for the Colorado Buffaloes, first taking the indoor title over 5000 meters in 2003 then the 10,000 meters outdoor title in 2005. In 2007 she won the 10,000 m at the Pan American Games, setting a Games record time. The following year she was the USA champion over 8 km and just missed an Olympic spot in the 5000 m after a fourth place finish at the Olympic Trials in 2008. Gary was the British Champion in the 5000m and was in the finals in the 5000m at the 1988 Olympics. 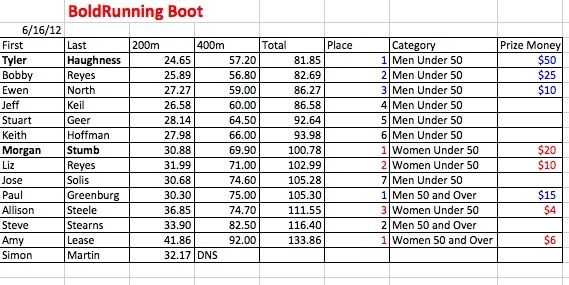 Why the heck is it called "boot"? Definition of boot: (Slang) to vomit. As in Sorry, "I didn't mean to boot all over your couch." We hope you don't, but you just might.